What Types of Dogs and Dog Breeds Have Ears That Need Special Attention and More Cleaning Than Others? Dogs with drop ears are more prone to ear infections than other dogs. Photography ©M_a_y_a | E+ / Getty Images Plus. Some dogs, especially certain dog breeds, are prone to developing ear infections. Dogs with drop ears (those that hang down like a Cocker Spaniel, Basset Hound or Labrador Retriever) are more prone to ear infections than dogs with ears that stand upright. This is because floppy ears don’t get a lot of air flow, so debris and moisture get trapped more easily inside the ear canal, where it can fester and bloom into a bacterial or yeast infection. Some breeds like Poodles and Bichons Frisés grow hair inside the ear canal, which can further limit air flow and lead to ear infections. Other causes of ear infections include mites (pesky parasites that live inside the ears) and allergies. If your dog is prone to ear infections, cleaning the ears regularly might reduce their frequency. Exactly how often you clean the ears depends on your dog. You want to clean them often enough to keep infections at bay, but not so often that you irritate the ears. Ask your veterinarian how frequently you should clean your dog’s ears. For some dogs, you will need to clean the ears monthly. For other dogs, you’ll need to clean the ears every other week or even weekly. Even if your dog doesn’t tend to get ear infections, cleaning them when they look or smell dirty is a good idea. A dog’s ears should never smell bad. A foul odor or yeasty smell like bread dough means an infection is brewing and your dog should see the vet as soon as possible. Other signs of an ear infection include red, inflamed ears; head shaking or scratching at the ears; and ear discharge. Ear infections in dogs can be extremely painful, so do not delay seeking veterinary treatment if you suspect a problem. And if your dog yelps or cries when you touch his ears, get to the vet quickly. Should You / Can You Clean Dog Ears at Home? If you’re nervous about cleaning your dog’s ears yourself, you could always bring him to your vet or a groomer instead. This might get expensive if your dog needs frequent ear cleanings, though. Cleaning your dog’s ears at home is easy to do with the right supplies and techniques. 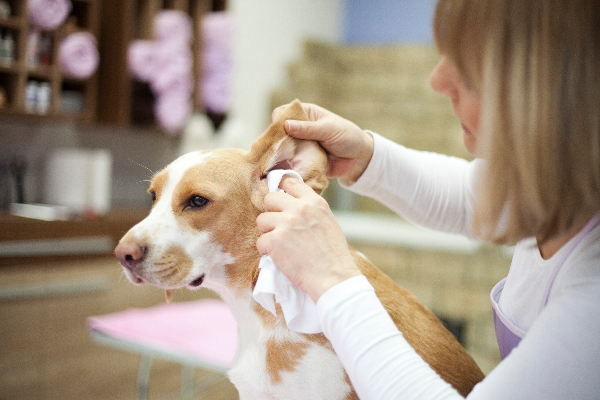 You could also ask your vet or a veterinary technician to show you how to clean your dog’s ears in the clinic so you feel more comfortable when doing it at home. You can clean your dog’s ears yourself at home! Photography ©mykeyruna | iStock / Getty Images Plus. To get started, you will need cotton balls or gauze and a vet-approved ear cleaner. You can buy ear cleaners from your vet, at pet-supply stores or online. Just be sure you get your vet’s all-clear before using any product to ensure it’s gentle and safe for your pet. 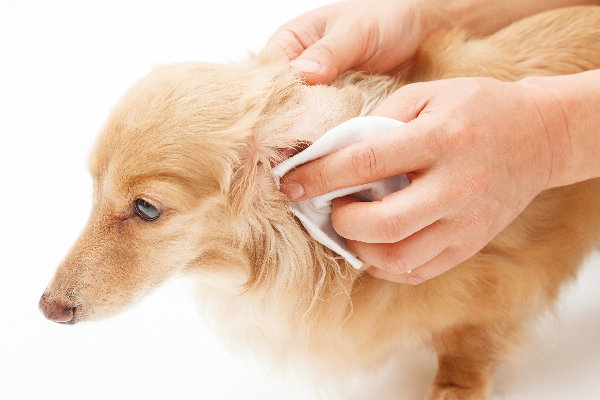 Cleaning the ears can be messy, especially if your dog’s ears are excessively dirty. I like to clean my dog’s ears during his bath. If you’re cleaning the ears and your dog doesn’t need a bath, you can wrap a towel around his neck and chest (secure it with a hair clip or large chip clip to hold it in place). This will keep him from getting ear cleaner and ear gunk all over his fur. To clean the ears, squeeze a little bit of ear cleaner into the ear and let it drip down into the ear canal. Gently massage the base of the ear to suds up the cleaner and help it break down wax and debris. Let your dog shake his head (you can lightly drape his head with a towel to keep the gunk from flying all over). Gently wipe the outer ear flap and inside the ear with a cotton ball or gauze square. Wipe as far down you as can, using the cotton ball or gauze and your finger. “I generally don’t like to put Q-tips down the ears because I don’t like to push stuff down,” advises Dr. Grognet, who also operates the ACE Academy for Canine Educators. Keep wiping until your cotton balls come back clean. Pet ear cleaners contain drying agents, so any small amount of cleaner left inside the ear will dry on its own. If your dog has an ear infection and needs medication, apply it after the ears are clean and wiped out. “I like to keep the tip of the ointment well above the ear so I can see how many drops are going in and then just massage the ear below,” Dr. Grognet says. What About Plucking Your Dog’s Ear Hair? If your dog has a lot of hair growing in the ear canal, it might be beneficial to pluck it out prior to cleaning the ear. If you’re nervous about doing this, ask your vet, vet technician or groomer to show you how to do it. Some people use their fingers to pluck small amounts of hair out, working a little bit at a time. Other people prefer to use hemostats (special blunt-nosed tweezers). If your dog’s ears seem red and irritated after plucking out the hair, try waiting a day or two before cleaning your dog’s ears to give the skin time to calm down so the cleaner doesn’t sting or cause further irritation. Tell us: Do you clean your dog’s ears at home? How often do you clean your dog’s ears? Any tips to add on cleaning your dog’s ears? Thumbnail: Photography ©andriano_cz | iStock / Getty Images Plus. The post Wondering How to Clean Your Dog’s Ears? A How-To (and How Often!) Guide appeared first on Dogster.